Last time around, we put out capsules a couple of hours before the games got started. That's what happens when you aren't as focused on what's going on, sadly. We're a little more focused this time. At the very least, let's get started with Gary's handy chart for interpreting what we might see in the semifinals next week. This is the final season for the league tournament's conclusion in Atlantic City. Each of the series outlined below will provide one team for that, erm, historic occasion. Every home team is at least in the hunt for an NCAA bid - in fact, as of now, all four are in our projected bracket for the week. Dartmouth and St. Lawrence are kind of hanging around but probably need to win the tournament to play Easter weekend, while Cornell and Brown certainly need the autobid. Quinnipiac leading scorer: Jeremy Langlois, senior. 12 goals, 16 assists. Quinnipiac starting goaltender: Eric Hartzell, senior. 1.49 GAA, .936 save percentage. Cornell leading scorer: Greg Miller, senior. 14 goals, 18 assists. Cornell starting goaltender: Andy Iles, junior. 2.28 GAA, .916 save percentage. Chances are pretty good if finishing first in the ECAC gave you the option of choosing which opponent you wanted to face in the quarterfinals, Cornell probably wouldn't have been Quinnipiac's choice. The Big Red were supposed to be in their usual place among the top teams in the league (not to mention, the nation), but that all fell apart through a lousy January and a rough start to February. Problem is, the Big Red have looked much more like their usual selves in the last four weekends, which almost certainly gives the top-seed and the nation's #1 team (for five straight weeks) a little bit of pause, especially given that the Bobcats were not as dominant in that same stretch of time as they had been earlier in the season. Then again, they had very little to play for aside from the PairWise Rankings for most of February, as they locked up the top seed very early. But "not as dominant," in this case, folds out to a 3-2-1 record in their last six games, and the Bobcats more than handled Cornell this season, even in November before the Big Red's dip began. There aren't a whole lot of flaws in Quinnipiac's game, and it's worth pointing out that Quinnipiac has still been the top team in the polls, PairWise, and KRACH throughout that period. Cornell may have taken it to a fading Princeton team last weekend, but they're going to need to bring it, big time, if they're going to make it back to Atlantic City. The Bobcats are assured a spot in the NCAA tournament (and almost certainly as a #1 seed) no matter what, but to lose this series would be a major disappointment for the Q.
RPI leading scorer: Nick Bailen, senior. 12 goals, 19 assists. RPI starting goaltender: Jason Kasdorf, freshman. 1.51 GAA, .940 save percentage. Brown leading scorer: Matt Lorito, sophomore. 17 goals, 14 assists. Brown starting goaltender: Anthony Borelli, senior. 1.74 GAA, .945 save percentage. Brown's defense wasn't worked too hard last weekend, easily taking care of a Clarkson team that was essentially punchless in the final two weeks of its season. Unless RPI comes out of their week off rusty and out-of-sync, they're practically assured of facing a much bigger challenge this weekend. We're going to break down this series far more in the coming days, but it's probably fair to say that the difference in offensive output is going to be a big deal in this series, and it's likely to leave the Bears with very little room for error. One of the main differences in the two games these teams played this season was in the home-ice advantage - RPI found the Bears much easier to deal with when they had the last line change. That should help the Engineers' already tough defense by ensuring that they get the matchups they're looking for when it comes to the more dangerous elements of the Brown attack. Yale leading scorer: Kenny Agostino, junior. 14 goals, 19 assists. Yale starting goaltender: Jeff Malcolm, senior. 2.45 GAA, .916 save percentage. St. Lawrence leading scorer: Greg Carey, junior. 28 goals, 23 assists. St. Lawrence starting goaltender: Matt Weninger, junior. 2.72 GAA, .916 save percentage. This may be one of the most intriguing matchups of the quarterfinals. Two teams that could have been higher seeds if they hadn't suffered a key injury at the wrong time are almost certainly ready for a high-flying series that's likely to be quite unpredictable. Drop the two Capital District losses at the end of the regular season out of St. Lawrence's record since February, and the Saints are clearly one of the hottest teams in the league when Kyle Flanagan is in the lineup. Checking out the scorelines from the week before and the week after that dreadful weekend, it's like night and day. Yale basically has the same phenomenon surrounding netminder Malcolm. For years, Yale's problem has been finding a solid goaltender to back their wealth of firepower, typically all they really need is a halfway competent netminder to be successful, and they've got in Malcolm at least that. He was hurt against Princeton on February 1. The Bulldogs won that game, but then lost five in a row without him. He returned, and the Bulldogs won three straight to end the season. 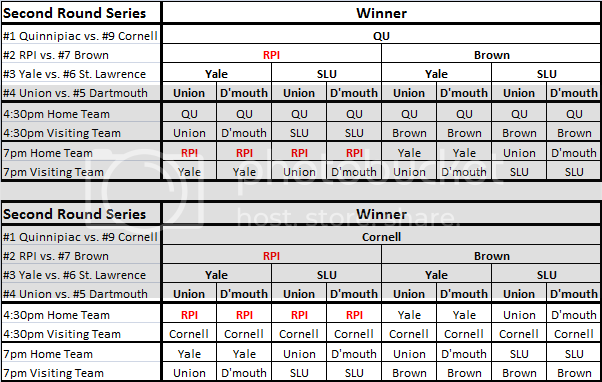 Now, Yale was also playing some tough defenses during that five-game losing streak - Quinnipiac twice, Brown, RPI, and Union - but Malcolm probably would have given the Bulldogs more of a shot in those games. Regardless, the offense for both of these teams has been more central to success than the defense, and that's why this could be a series that's difficult to get a feel for. SLU's top line of Flanagan, Carey, and Jeremy Wick is easily one of the best in the country, and can be deadly on the power play. Yale, meanwhile, has a number of lines that can cause problems. This is not an easy series to predict - the Bulldogs probably have the edge on the simple fact that they're at home, and had the Saints' number during the regular season. Union leading scorer: Wayne Simpson, senior. 15 goals, 16 assists. Union starting goaltender: Troy Grosenick, junior. 2.22 GAA, .920 save percentage. Dartmouth leading scorer: Tyler Sikura, sophomore. 11 goals, 20 assists. Dartmouth starting goaltender: Charles Grant, freshman. 2.62 GAA, .914 save percentage. You're not reading that wrong - Union has been in the ECAC since 1991 and this is the first time these two teams have ever faced each other in the playoffs in any capacity. It's a battle between two teams that basically limped to the finish line in the regular season, with the Dutchmen just managing to snag the home-ice bye thanks to an even weaker finish by the North Country teams. Union has had their problems on the road, last winning away from the Capital District on January 11 at Princeton, and before that November 9 at Harvard, but they're unbeaten in eight straight games in the Capital District (including the game in Albany against RPI). Dartmouth, meanwhile, is 3-7-3 on the road this year, and last weekend won two consecutive games for only the second time since December. Their young but talented offense simply has not been as strong in the last two months as they were early in the season, when they looked sure to be making their first NCAA appearance since 1980. Both teams have had turnover in net - Dartmouth appeared to have settled on Grant heading into the playoffs, only to see Cab Morris start (and lose) Game 1 of the first round against Harvard. Grant won Game 2 and Game 3, so we might expect to see him again. Meanwhile, Grosenick's health has been a major factor all season for the Dutchmen, who have had to occasionally lean on sophomore Colin Stevens more than they have wanted to. The week off was just what the doctor ordered for Union on that front. Union has the experience and the home ice advantage, but Dartmouth showed off their resilience last weekend by coming back from a Game 1 loss to win a series against a somewhat resurgent Harvard team. They have the chops to get the job done, but they're going to need some good puck luck and some better overall play to get there.